As you can see from the list above, we are slowly going through the last of some crops. I'm pretty amazed the leafy greens lasted this long, especially since they were growing outside. We are happy about the cilantro because it means we can make a few more batches of Shain' incredible salsa. I'm a little sad about the zucchini and squash coming to an end because it usually signifies summer is finally over. We dug up the Yukon Gold potatoes last Saturday. They usually out produce the Red Norland potato plants, but not this year. The yield was down significantly. There will only be enough Yukon Gold potatoes to give to the CSA one more time. Can you feel the hard work, love and positive energy that goes into this produce we are growing for you? That may sound crazy to some, but I can feel it. It's so much more than great taste. This food is alive and I'm so glad my senses are accute enough to notice when I eat it. 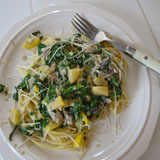 When I eat dead foods (I confess to eating store bought, processed food on occassion), there is a noticeable difference. This is anohter reason why I am happy to be a farmer, your farmer. Leek & potato soup! We have a really tasty recipe here, but it calls for bacon and a pint of heavy cream. Nothing necessarily wrong with that, but Shain's on the look out for a healhiter version that still tastes great. He's lost 75 lbs. since April 1st and is still going strong! Go Farmer Shain! We experienced a few nights of hard freeze last week. Temps got down to the low 20's! Fortunately, our only remaining outside crops were the potatoes and the last rows of salad mix. When the tops of the potato plants die back, it's time for us to harvest them. Last Saturday we got all the Red Norlands dug up. This weekend we'll get all the Yukon Golds. 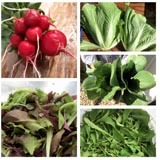 As for the salad, these greens have an amazing way of rebounding after a hard frost. It took a few days, but by Monday morning the salad was nice enough to cut. I left about half of it for another week but at this point it all depends on the weather. With seven greenhouses, most of our plants are growing under cover and can be closed up for the cold nights. We also use row covers over sensitive crops that we hope to pull through the rest of the season. Even with all this protection, some crops didn't make it. We lost the cucumbers and half the squash plants entirely. The yellow onions look pretty bad too. About 25% of the tomato plants froze. And the sadest loss for me is seeing the brown leaves on the fillet beans. I hope they'll still grow beans down low, but Shain doesnt' think so. He has decided this was not the year for us to have beans, despite all our efforts. The next big project underway is preparing a section of field for planting the garlic. We usually plant garlic around the first weekend of October, again, depending on the weather. And we are slowly starting some clean up projects, pulling up dead plants, drip lines, and such. Lots to do before the weather turns ugly. It's been a mixed up, hectic, change of plans, take care of this now kind of weak here on the farm. Nothing life altering, just time cosuming when time isn't available. Fall is a beautiful time of year, but it's also a busy time of year! As a result, this week's CSA share is smaller than what we planned on harvesting for you this week. Still, a pretty good amount of food. Garlic - a 1 lb. bag of a variety called Music. It's Shain's new favorite. The weather has changed a bit on us this week. With forecasted temps in the low 30's we are closing all the greenhouses at night and covering all sensitive produce with row covers. (Then reversing the process every morning.) Our daily chores just increased significantly, but it's well worth the effort. While many gardeners will loose crops this week, we expect to pull everything through with little or no damage. (Confession - I won't be too upset if the zucchini or squash plants die, but we'll cover them anyways.) Looks like the weather will warm up again later this weekend, who knows what to expect around here. Linda, a long time CSA member, shares this recipe with us - Refrigerator Pickles: Cauliflower, Carrots, Cukes, You Name It. She says "We tried this and we love it! My husband says to cut the jalapeno in half, but I thought it was good whole." Here's the link. Sounds like a good way to use up some extra veggies. Shain's newest wonderful meal creation is a veggie quesadilla. In one pan he sautee's a lot of veggies (peppers, squash, zucchini, onions, whatever is on hand) in their own juices (no oil or butter necessary). In another pan he cooks and smashes up a can of organic black beans to make his own refried beans. I think he also adds some seasoning to taste, freshly ground garlic powder or chili pepper maybe? In a third dish, he drizzles sliced tomatoes with freshly squeezed lime juice and allows this to marinade for a few mintues. Then he spreads the beans on a corn tortilla, adds a scoup of veggies and tomatoes, sprinkles a thin layer of grated cheese (which means even our son will eat this) and then tops off with another tortilla. The quesadilla is heated through (both sides) in a large frying pan until the cheese melts. Served with with salsa on top. Very tasty! We have some extra garlic for sale. Mostly Music but also a little German Extra Hardy (smaller sized bulbs). $8/lb. Contact me if you are interested. We invite anyone who'd like to come help on the farm to join us on Saturdays. We'd love to have work crews here every Saturday to help dig potoatoes, harvest other produce, prepare new ground for planting garlic, and other projects. There's a lot to do here and we are finding ourselves a little short on helpers. Contact me for more specific details. Have a good week and ENJOY your veggies! I'm back. Edited. See italics. Leeks - our first time growing leeks in a greenhouse. Some of them are huge. Many more for weeks to come. Garlic - a 1 lb. bag of German Extra Hardy garlic in this week's share. It's a little on the small side as we kept back the largest garlic to plant this fall. Remember, we are just working our way out of a complete garlic crop failure from a few years ago. It will take years to get back to what our garlic looked like before. Zucchini - it's starting to get much colder at night so the squash and zucchini plants are going to start slowing down, even dieing back with freezing temps. We've already enjoyed a great harvest of squash and zucchini so we've decided to let nature take it's course and spend our energies helping other delicate crops through the cold nights. Green Bell Pepper - don't they look great! When the workshares saw this list of produce today, they couldn't believe it. I told them "I know you'll make it work". And that's just what we did. Now it's my turn to make all this fit in my truck to make the delivery. Wow! That's a lot of food, again! We are making pesto with our basil and garlic this week. Some for the freezer too. I've read some recipes that also call for adding parsley to the mix. And it's all in your share this week! Onions freeze very well without any work. Just chop and put in baggies. I like to use the snack sized baggies because it's about the quantity of onion I need for winter recipes. I haven't found they get freezer burn if I pack the bag full. Dehydrating onions is also very easy, especially if you have a good dehydrator. I like to do a rough slice/chop (bigger pieces so they don't fall through the holes in the trays). I dehydrate our onions on a low setting over night. The house smells of onions pretty strong (this is good or bad, depending on the day) and then store in glass jars or zip lock bags. Shain eats dehydrated onions like a treat. They rehydrate very well. Leeks - I chop them into thin round discs and either freeze or dehydrate as explained above. Beets - we love pickled beets in our home so I do a large batch of these every once in a while. There are many recipes online. I like the simplest ones best. I've never personally canned the golden beets, but one of our workshares has and she says they taste just the same as regular red beets. I'm told beets don't dehydrate very well, though I've never tried. They can be frozen with some preparation work. Freezing instructions usually call for the beet to be blanched first (put in boiling hot water for a few minutes), but I have been told by many people that they just roast the beets, eat some and freeze the rest. Not as great as fresh, but still better than store bought. Carrots dehydrate very easily. Just chop and put in the dehydrator on a low setting overnight. To make this process very easy, I use a Salad Shooter. Great tool for people who do a lot of dehydrating. Personally, I haven't had much success with canning or freezing carrots. I find they get too mushy, but if you are doing it for soups that wouldn't matter. Shain uses our dehydrated carrots in stir fry and they taste fresh. It's amazing.